Our little filly could barely stand on her own, let alone feed. We had to step in. Sleeping in her stable, milking Piper and bottle feeding Millie for a few days after she was born was crucial for the foal to survive. Piper was brilliant and supported us all through. Now that Millie is all grown up however, Piper has gone back to being her grumpy old self. Affectionately known as The Grinch back at the sanctuary, she is impossible to show love/affection to as she comes at you ears pinned back and teeth bared. Piper is great when she knows she’s being handled though, she patiently waits as the neck rope is put on (she hates halters) and walks happily and quietly beside whoever leads her. She’s also perfectly behaved while the farrier works on her hooves, making her the strangest little pony we know. Piper and Millie are now both happy, gorgeous and healthy ponies, enjoying their lives wild and free on the backwaters. Feed: We’ve calculated Piper’s diet based on her estimated weight and body condition. Her diet currently includes 85% dried oats,15% bran mash, rock salt (mineral supplement), and a Himalayan powder, brilliant for digestion. From the busy roads of Bangalore to her new home on the backwaters. No more traffic dangerously speeding past/honking noisily all day/night. No more scrounging for scraps of food on the garbage filled streets. No more screaming kids throwing stones. 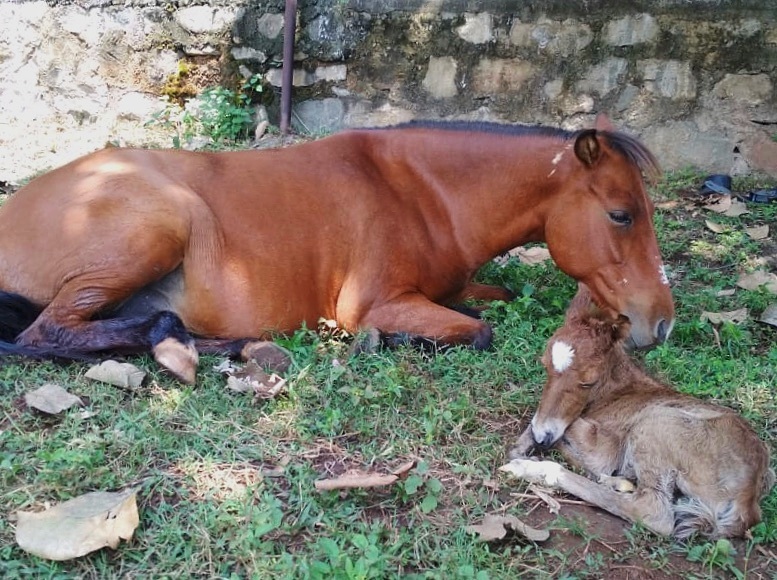 Piper was found on the busy roads of Bangalore, heavily pregnant. We knew we had to rescue her quickly as there was no way a foal could survive in those conditions. Piper, Sawyer and Pickett arrived together at the sanctuary on the 23rd of September, 2018. Given the stress she went through, what with all the moving around and the 6 hour journey, Piper gave birth exactly a week later (30th September) to a premature foal.